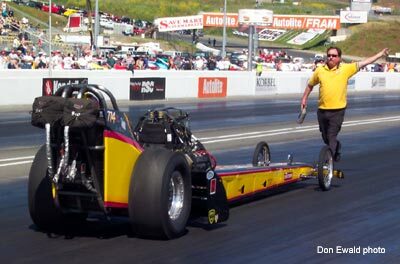 Jim Murphy and the OSH-WW2 Racing team saw their winning streak come to an end at the 15th VRA Nitro Nationals at Infineon Raceway with a runner up finish to Jack Harris. 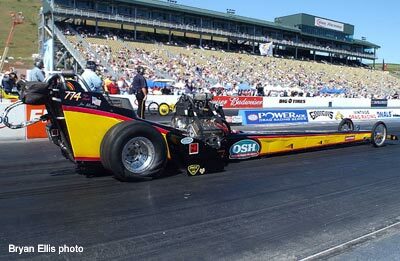 Nonetheless, the runner up allowed Murphy and the OSH-WW2 Racing team to maintain the points lead in VRA Top Fuel and as a consolation, they netted low ET of the meet with a 5.93.The goal for 2003 was to regain the # 1 on the side of the car and so far, so good. 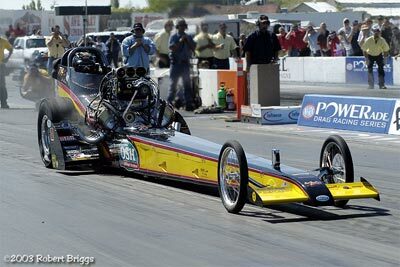 The Top Fuel final should have been a great match up pitting Jack Harris who had run a 5.98 in round 2 against Jim Murphy who'd carded a 5.93 in the opening stanza. 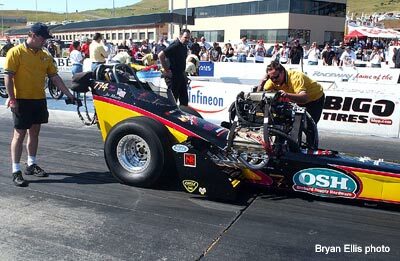 However, Murphy had to do a complete engine swap after the semis and in the thrash one detail was missed - the throttle stop used on the burnout. 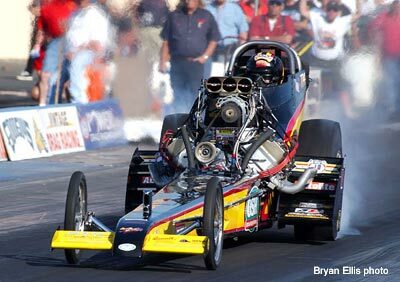 When Jim went to heat the tires nobody was home - the stop wouldn't allow enough throttle to smoke the M&Hs. 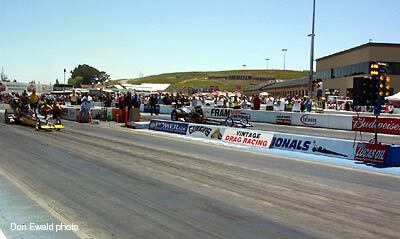 Everybody, including Harris would have rather had a clean drag race. 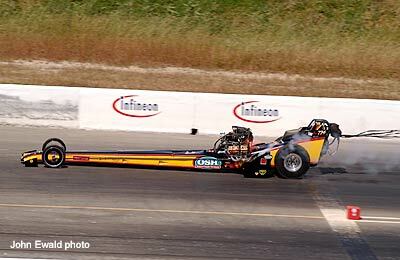 At the green Harris was gone and Murphy blazed the tires about 200 feet out and shut her off. End of deal. 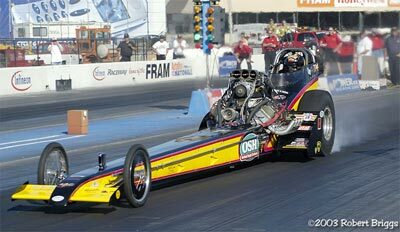 The Sheriff motored on down for the win with a 6.11 at 223. After losing to Murphy in the final at the 2003 March Meet, Harris evens the score. 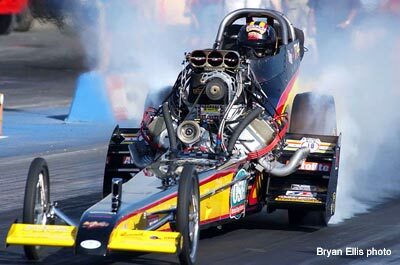 Unable to negotiate a burnout in the finals, Murphy had no choice but to go for it. These photos tell the results. It's one thing to spin the tires on the top end, but you can't recover from blowing them off at the bottom ... not against Harris anyway. 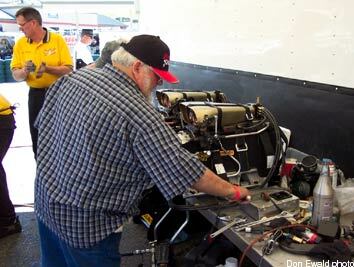 Race day started off very good for the OSH-WW2 Racing fueler. 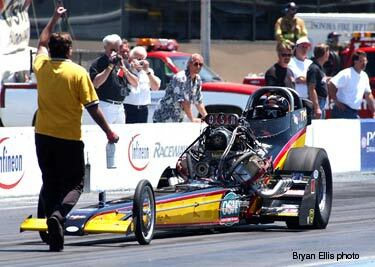 After qualifying # 2 with a 6.02 at just 197, Murphy drew Mark Malde in round one. 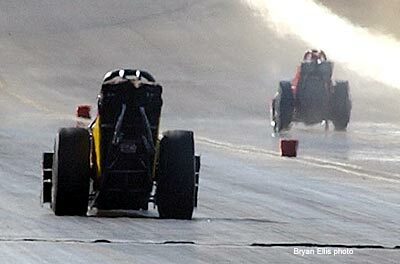 Sounding good on the burnout, the only concern was how bad would the tires spin on the top end. The concern was well founded. Here is a series of photos of the Low ET run. 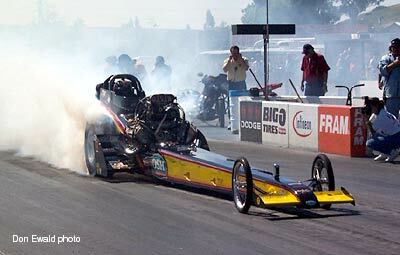 Barry Byrne makes a last minute adjustment to the injector as Jeff Shamrock checks the chutes and prepares to activates the data computer at the rear of the car. At the green it was all Murphy. As they say in horse racing, he was quite the best running low ET of the event. 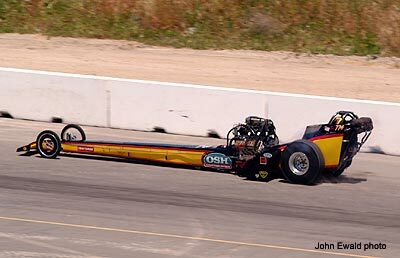 In spite of spinning the rear tires from the 800 to 1000 foot mark (where he shut it off) Jim still ran a 5.93 at 217. As it would do on every run, the engine RPM soared to 10,300 plus. 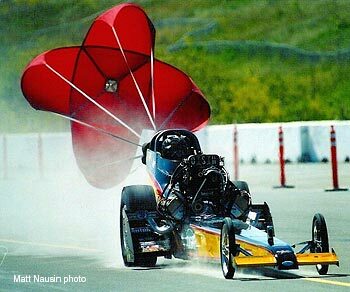 When this happens its impossible to make a full 1320 foot run without blowing up. 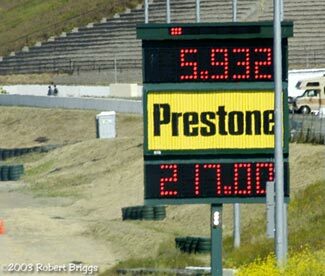 As illustrated here, the track was very good for the first half but was not prepped well enough to handle the high horsepower cars on the other end. 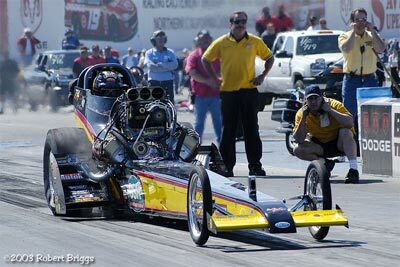 At the 1100 foot mark Murphy has closed the throttle and literally lets his momentum carry the car through the lights. 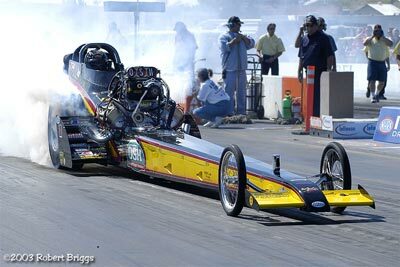 The data computer showed it would have been a low 5.80 240+ run had the tires not gotten loose forcing an early shut down. 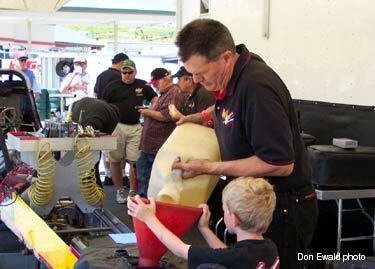 Like most drivers, Jim Murphy packs his own chutes and mixes the nitro. 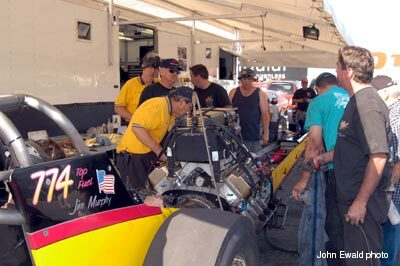 Here Jim and his right hand man, Rick Nordness fill the tank with fuel before their second qualifying attempt. 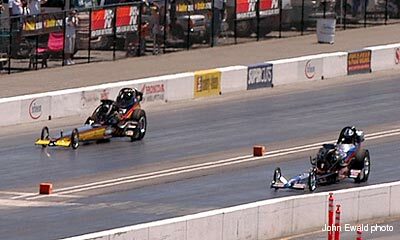 Between rounds its SOP to tear the engine down and service the clutch ... especially when you're running on a loose track. 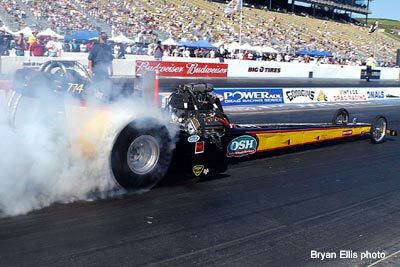 Spinning the engine at high RPMs can hammer bearings, stretch rods and beat up the valve train (as they found out in the semis). 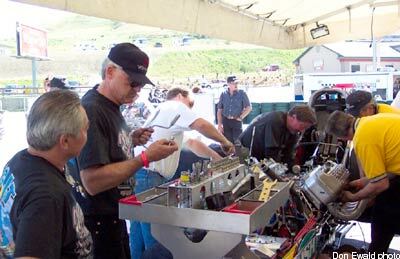 The volunteer OSH-WW2 Racing crew is among the best in Nostalgia Top Fuel and its amazing how hard they work just for the love of it. 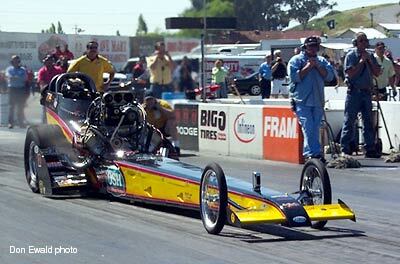 In round two Murphy faced the always tough Brendan Murry who'd run 6.03 @ 228 in round one. 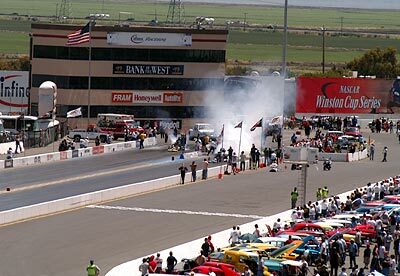 After the burnout, both cars back up in unison. The race was over before it started. 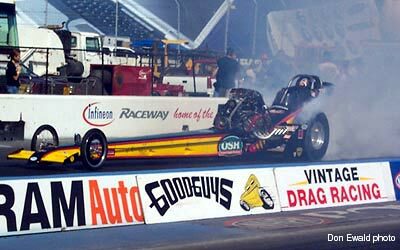 Murry got a bit anxious and left too early (see red light in photo) while Murphy cut a nice 0.481 light and ran another tire spinning 6.01 @ a shut off 214. In spite of his red light, Murry made a 800 foot pass which gave the fans a show. Here Murphy blasts by him at half track. 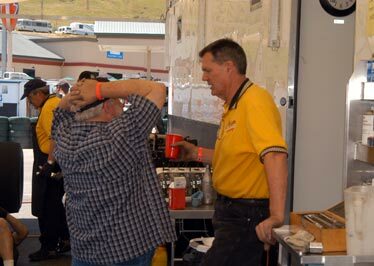 After each pass, Murphy and crew chief Tim Beebe always go over the run and formulate a game plan for the next. 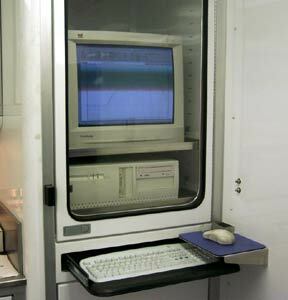 Much of their tuning decisions are made from the data collected on the previous run and displayed on the computer in the trailer. 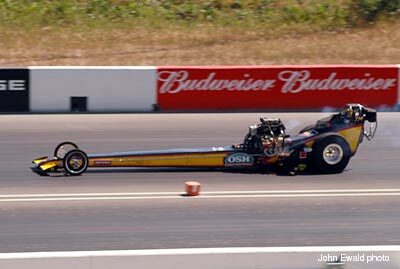 In the semi finals, Murphy was paired with Jeff Diehl. 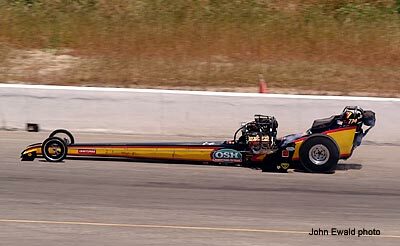 Luckily for Jim, Diehl smoked the tires early and was out of the race before the OSH-WW2 car broke an intake valve and suffered a severe engine damage down track. 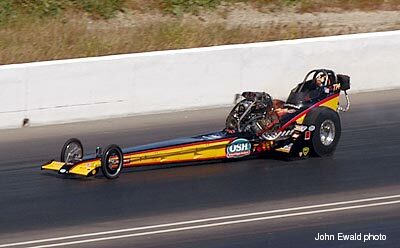 Murphy coasted through (below) with a 6.36 at just 167 MPH. 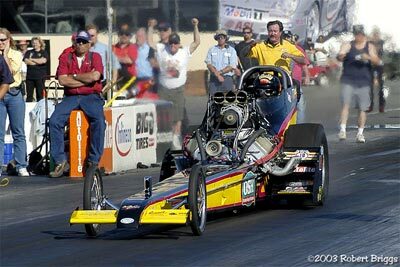 As he always does, Barry Byrne backs Jim up after his burnout. Murphy launched hard but the top end tire spin finally bit him. Luckily the valve damage and blower pop didn't result in a fire or oil down so Jim was able to coast to a safe stop. 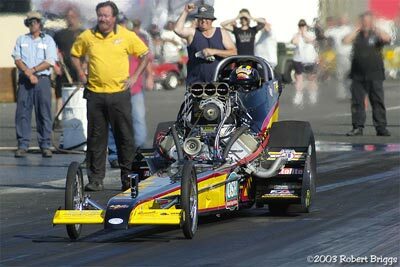 The broken intake valve resulted in a huge thrash to put a new engine in for the final. 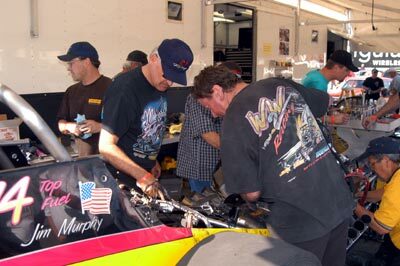 Before the car was even off the ground, fellow racers Rick McGee, Bill Dunlap, Brendan Murry, Davey Urehara, the Ground Zero crew and more were on hand to help. Thanks to everyone, Murphy made the call only to lose to Harris in the final. Tim Beebe has the spare blower and injector aside the damaged unit, making sure the spare is set up identical to the one that was on the car. 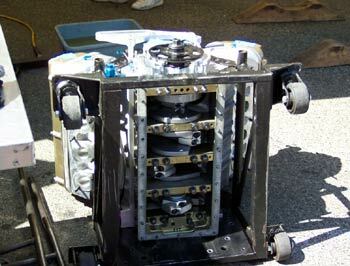 A new short block is ready to go into the car. 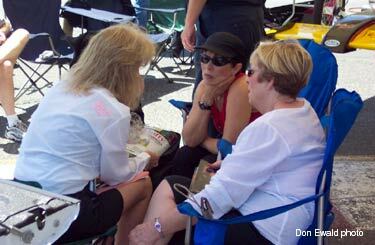 While the guys thrash, the gals talk. Go figure. 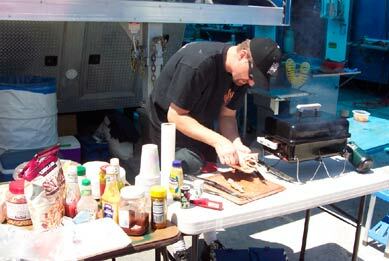 There's always time for some good food and Jim Nordness cooks up some great tri-tips for the crew and photogs <grin>. 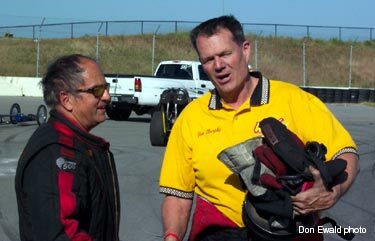 Adversaries on the track, friends the rest of the time - Jim Murphy congratulates Jack on his win. 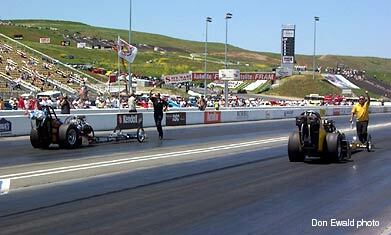 Some say these two are the "Bernstein & Dixon" of Nostalgia Top Fuel. Could be. The chances are they will do battle a few more times before the season's over and the outcome will probably be a coin toss every time. 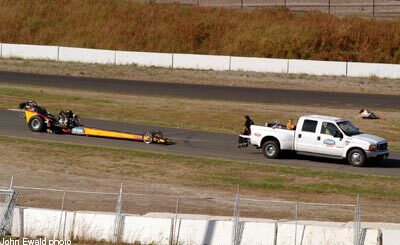 The OSH-WW2 Racing team makes the long tow back to the pits after the finals.